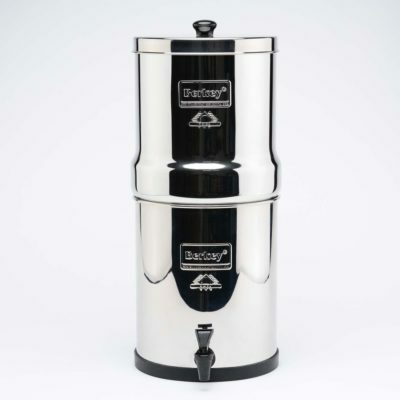 The compact Travel Berkey® system is the perfect water filtration system for use during travel and any outdoor activities or during unexpected emergencies. Free Shipping in the USA. 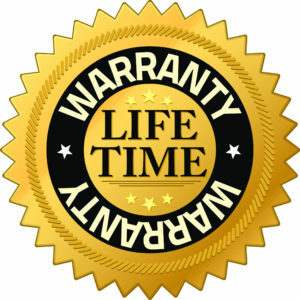 We provide a lifetime warranty above and beyond the manufacturers warranty on all Berkey stainless steel canisters, spigots, washers, and wing nuts. Offer Excludes Black Berkey Filter Elements in which case manufacturers warranty applies. Add any item below and save 5% off system and accessories! 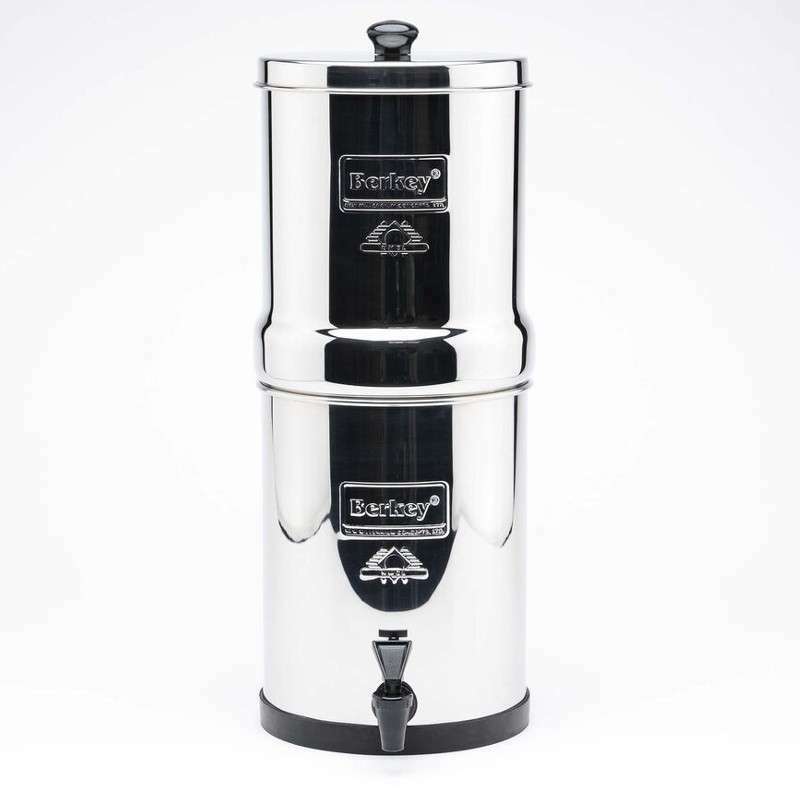 The compact Travel Berkey® system is the perfect system for use during travel and any outdoor activities or during unexpected emergencies. The Travel Berkey® system removes pathogenic bacteria, cysts and parasites entirely and extracts harmful chemicals such as herbicides, pesticides, VOCs, organic solvents, radon 222 and trihalomethanes. It also reduces nitrates, nitrites and unhealthy minerals such as lead and mercury. This system is so powerful it can remove red food coloring from water without removing the beneficial minerals your body needs. Virtually no other system can duplicate this performance. Height x Diameter (inches) 18” x 7.5”; The upper chamber nests within the lower chamber for transport and stands only 12” in height. Holding capacity: Aprox. 1.5 Gallons. Configured with two Black Berkey® purification elements the system can purify over 2.5 Gallons per hour. I am sorry to do this this way but I do not personally own this system. The people I work for do and I very much covet having one myself. I want this size because I personally have a small family. The water tastes delicious through this system. And after researching water filtration systems, I know for a fact this is the best one money can by. Even if I had to filter pond or rain water I’d bee all set for many years to come with this system. Just returned from a month long trip down south and sooo glad I brought the Travel Berkey with me. Georgia water was very chlorinated and with wanting to drink 1 plus gallons of water a day for health and after workouts, it was huge! Basically filled it once a day and is gave me the fresh clean water I wanted. Setup and takedown were easy. I precharged the filters per the instructions and after the first filtering was discarded, as prescribed, it was ready. Probably saved $50 plus on bottled water and the Berkey is barely broken in. Plus I have the knowledge of setup and use to expedite future uses. Just be careful not to overfill the upper chamber as the water will flow over and out of the lower part of the filter system if overfilled. Thanks for a great product! I have been using my new travel Berkey for a couple of weeks. Love the stainless steel. It seems to be slow so I fill it and walk away. We have been using our RO system for years. The water tastes really great and we add minerals to the filtered water. The Berkey water doesn’t taste real good. Reminds me of well water. I am taking it straight from the tank before the water softener. It is leaving a scum in my teapot, the tea tastes like dish rag, and the tea is cloudy. Any advice or is the water supposed to taste like this? 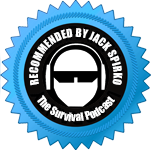 I have read so many rave reviews. The shipment arrived when expected and was packed to avoid the rough handling we have come to expect. We recommend making sure to purify the water before it goes through an RO System or Softener. Also, please do a red food coloring test to make sure it is removing all of the red color.